Recently, my friend Dawn and I got together for some much needed fun and two quick, but activity loaded trips. For the first trip, she had some tickets to Avondale Brewery's Spring Food Truck Rally. We couldn't let those tickets go to waste! 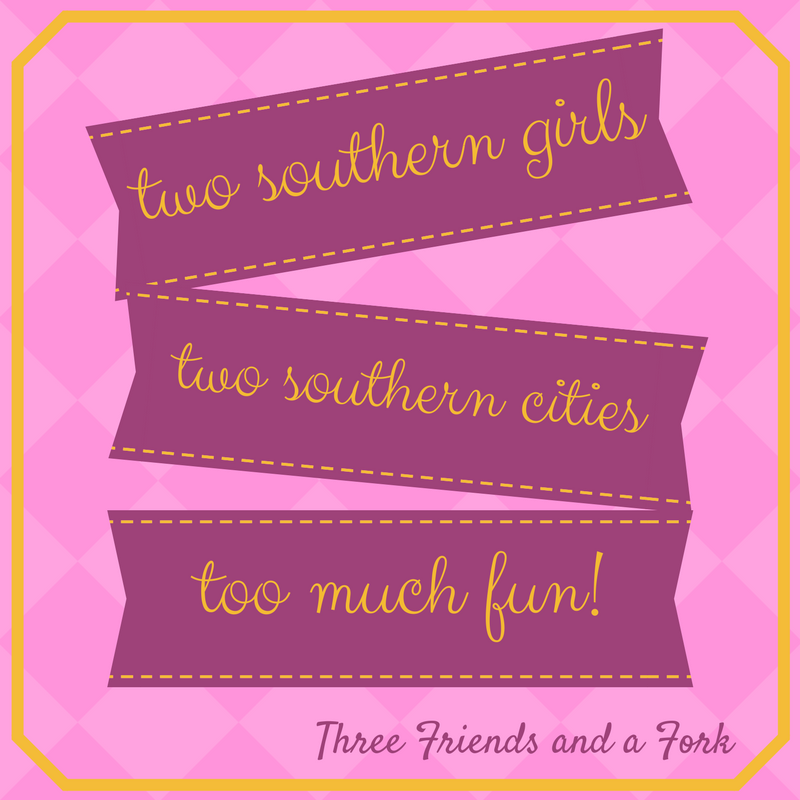 Of course it wouldn't be a Southern Girls' Adventure if we didn't get lost! We put the address in our GPS, but somehow instead of 41st Street S., we ended up on 41st Street. Let me tell you, those two streets are nowhere near one another. After much laughter and remembering the time Sherri, Lu and I got lost headed to the same location, we finally righted our ship and arrived at the rally. We also made a plan for the day. Knowing we wanted to taste several different things, we decided to split every thing we ordered so we could sample many different things. After securing a parking spot and walking to the entrance to the rally, we found the end of the looooong line and waited our turn to get our bracelets and join the hungry crowd checking out the food trucks. We didn't know we would need our driver's licenses to get through the gate, so Dawn had left hers in the car. Since she didn't have identification and she looks so darn young, she had to get a kiddie bracelet to make sure she didn't do any underage drinking! We were checking out the menu on the first truck, when a fellow visitor walked up to us and suggested it was a really good place to start. So that's where we started, at Shindigs Catering. The name of the truck gave us no clue as to what kind of foodie goodness we would be enjoying, but after hearing the guy taking orders giving a few descriptions, we figured it was going to be good. After much debate and hand wringing, we finally chose a pork belly Korean steamed bun with blackberry hoison, pickled vegetables, cilantro and a spicy sesame mist, a grass-fed beef burger called the Willis with applewood smoked bacon, gorgonzola, blueberry mostarda, truffle yogurt and arugula, an order of truffle fries, seafood spring rolls, and two watermelon lemonades. The verdict? The pork belly bun was righteous! Wow! We loved it. The burger and truffle fries were outstanding as well. The lemonade was deliciously refreshing, not too sweet, but just right. The only things we weren't crazy about were the seafood spring rolls. They were a little too fishy tasting for us, but everything else was incredible. We felt we were off to a great start. But what next? There were so many good choices! Post Office Pies? I have always wanted to visit Post Office Pies, but we really weren't wanting pizza at the moment. Big Spoon Creamery? That was tempting and it was hot outside! But we kept moving. Dreamcakes? Cupcakes were hard to resist, I'm not going to lie. But then we spied Heavenly Donut Company. That was too much and there was a lull in the line, so we jumped up to the window. Dawn chose a blueberry cake donut. I couldn't resist the maple bacon version, which I had sampled before on a trip to 30A, and we decided to share an apple fritter. Dawn apparently swallowed her blueberry donut whole, because I didn't have time to get a picture. Here are the maple bacon donut and apple fritter. Everything was delicious. After our dessert, we strolled around, deciding what to taste next. Honestly, we needed a little break, we were starting to get full and there was so much more to sample. We checked out what some of the other folks were eating, too. That's when I saw this lady with a giant tray of crawfish. I knew we could never eat that much, so I asked if I could take a picture. Those crawfish were expertly prepared by the Red Mountain Crawfish Company. I had no idea, at the time, that I would soon be tasting some of these delicious little lobsters. A couple of weeks after this rally, I went to a crawfish boil in Cullman and the Red Mountain Crawfish Company provided the crawfish as well as shrimp and it was all delicious. After walking around a bit and being nosy, we regained, if not our appetite, at least our ability to stuff more food in so we moseyed over to Snapper Grabber's Coastal Kitchen. By this time, Dawn's daughter, Lauren, had joined us, so we could split each order three ways. Snapper Grabber's specializes in wild caught Alabama Gulf shrimp, so we ordered a shrimp po'boy and they cut it in three pieces for us. We just had to try all of their sauces, Remoulade, Snappy, and Creole Tartar, and we're happy to report, they were all delicious! Snapper Grabber's was a hit! We never made it over to Saw's food truck, but, then, we already knew how delicious anything made at Saw's is. We did make it over to the Mexican food truck, Cantina on Wheels. I saw a lady standing nearby with her basket of nachos and they were so pretty, I just had to ask if I could take a picture! I wanted a fish taco with cilantro mayo, slaw and sliced avocado, because all the ingredients sounded so good, but the taco was made with tilapia, which I don't eat. So, I asked if I could have the fish taco with black beans instead of fish, which Cantina on Wheels happily accommodated. I was beyond thrilled with my taco. It was fresh and delicious, one of the best I have had! Dawn chose the Asada Taco, with grilled steak, pinto cream sauce and pico de gallo. Her's was good, but we both agreed, mine was better. We also shared some Mexican street corn which is one of my all time favorite Mexican menu items and Cantina on Wheels did not disappoint. That corn was fabulous! Lauren ventured over to Tot Spot which specializes in dressed up tater tots. I'm not sure what she got, but it was some kind of sweet, cinnamony concoction. She was wild about them. I don't eat tater tots, so I just took her word on that one. We ended the hot day on a cool note, with a strawberry lemonade popsicle from Urban Pops. It was a perfect ending to a fun and filling day! Three Friends and a Fork and Two Hungry Southern Girls give the Avondale Food Truck Rally and Shindigs Catering, Heavenly Donut Company, Red Mountain Crawfish Company, Snapper Grabber's Coastal Kitchen, Cantina on Wheels and Urban Pops 3 Very Satisfied Yums UP!